"He converted into a swing dancer just for me. It was the best wedding gift he could have given me... I can't thank Elena (Iannucci) enough for everything she did to make our wedding so special. Our first dance was my absolute favorite part of the whole evening!" "Thank you so much to our instructor, Jason Myra , and the wonderful dancers from our performance class who generously offered this gift of a performance at our wedding." Other Videos- Practice Runs...a Great idea! "We absolutely wowed our guests ... we NAILED our first dance! Everyone was absolutely amazed at what we had learned to do. We had so much fun learning to dance We even busted out some fancy moves as guests at other weddings. We look forward to refreshing our moves sometime in the near future.!!!" It's best to prepare for your first dance with the same care you give to your invitations, gowns, catering, flowers and music. We recommend you start planning at least 6 months prior to your wedding date so that you can choose your special song, the type of dance you want to do, and take lessons before "wedding frenzy" sets in! But...if you find yourself in a last minute crunch...we're at your service! Private lessons provide the best approach for First Dance preparation. They allow you to dance exclusively with your fiancee and work on choreography for your first song. 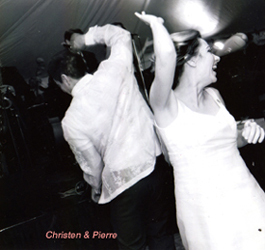 10-15 lessons is typical for couples who want their wedding song fully choreographed. Shorter timeframes are possible for those who want a more casual approach or are short on time. And don't forget Mom and Dad... we're also expert at turning those awkward back-and-forth Mother/Father dances into video highlights! 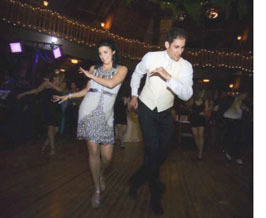 Instruction : You may call us at 212-807-0802 to inquire about having our talented instructors provide customized lessons either before your wedding (for your bridal party or close family and friends) or at your reception (as an ice breaker to get your guests up out of their chairs and onto the dance floor). 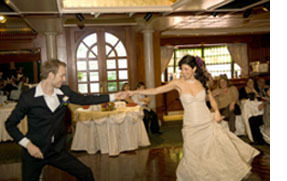 Performances : We'd also be happy to coordinate a couple or a group of dancers to perform at your wedding. It's a perfect form of entertainment for your guests! 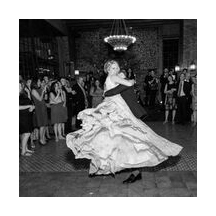 Contact our Wedding Specialist at info@dancemanhattan.com to discuss your wedding plans.